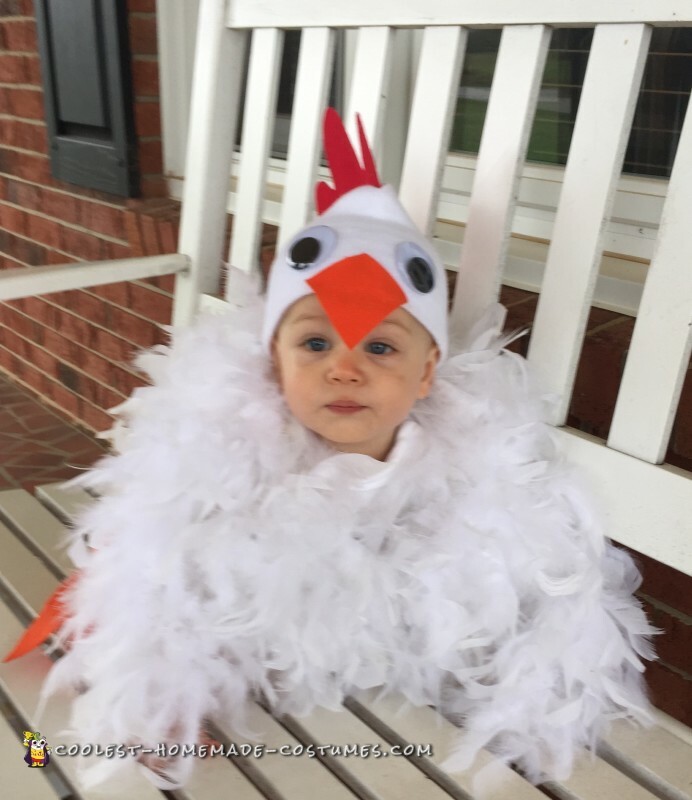 This year, I dressed my 10 month old son up as a chicken! It was so easy to make! And super cute! My sister got married 3 years ago and her theme was “feathers” so I had plenty to work with! 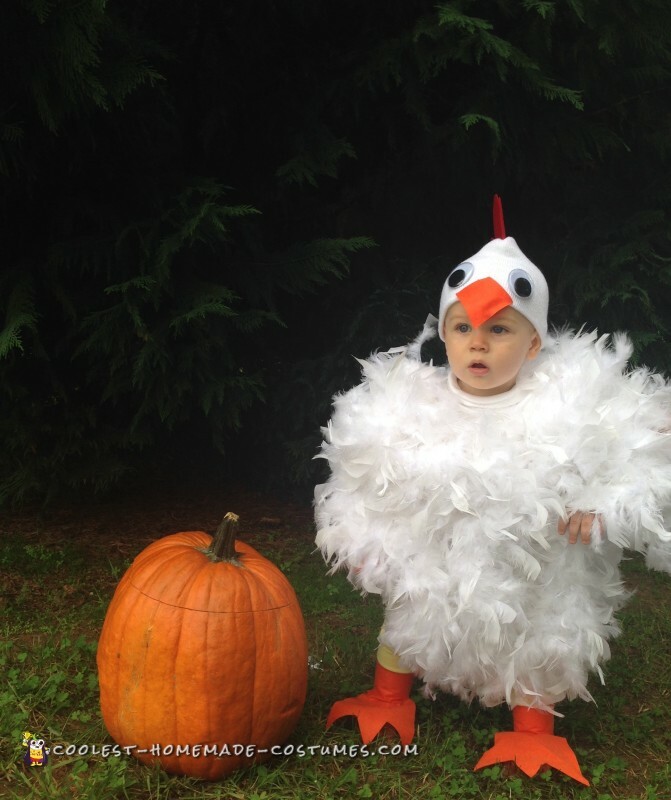 I bought a plain white, long sleeve onesie and hot glued 3 feather beaus all around it to create the body of the chicken! Next, I bought a plain white toboggan, cut out the chickens comb, and beak on colored felt paper, and glued them to the boggan. I also glued some googley eyes on there as well. 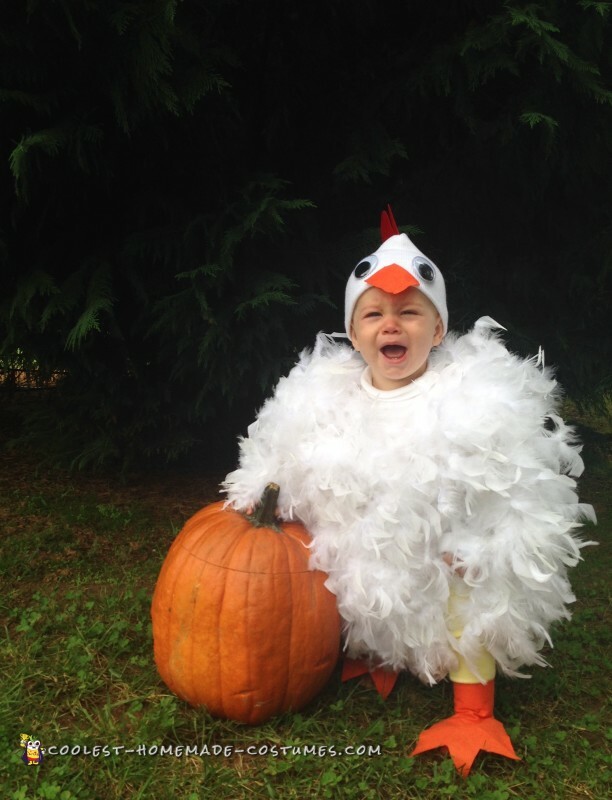 Next, I used my leftover orange felt paper to cut out the shape of the chicken feet and made it to where I could velcro it around his ankle to make it stay and also make it look like a real chicken foot! so cool! Then I just bought a plain pair of yellow cotton pants for his legs and I was done! As I said, he is 10 months old so I had originally bought a 12 month sized onesie. Well, after hot glueing all the feathers on there, I soon found out that stopped its ability to stretch so as I was trying it on my son, I only got it over his head and then it was stuck! I had to cut it off and go buy a 24 month sized onesie and start all over on the body again! Luckily, this one worked out much better. I took my son to a church trunk or treat, and a trick or treat event in an RV campground and everyone absolutely loved his costume! A few strangers even stopped me and asked if they could take his picture! He just started walking this week also, so when I put him down to let him roam, I couldn’t help but laugh at his “drunken” walk in that costume! People were stopping to watch him, it was so funny! The only downside was that everywhere we went, we left a long trail of feathers! 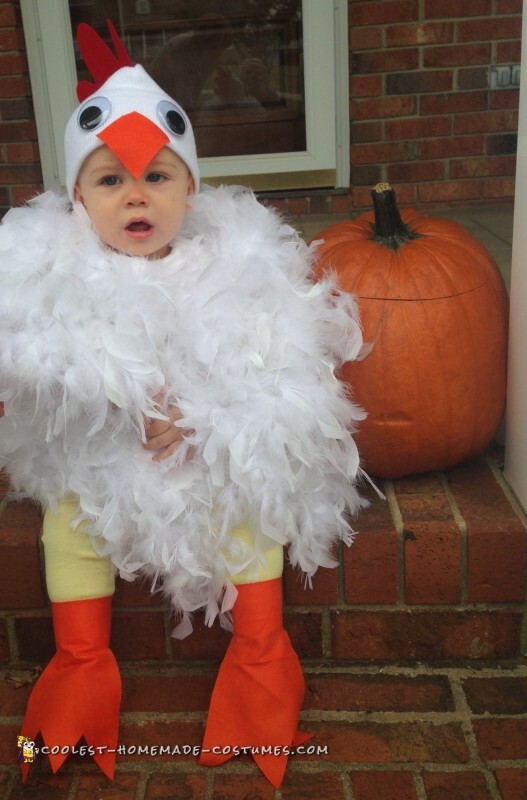 I don’t know how many times I had to re-glue or tape a strand of feathers back to his costume but it was worth it for the cuteness! A news station even contacted me over Facebook and asked to use his picture on air! This costume was a hit and he looked so cute in it, but it definitely was a mess. 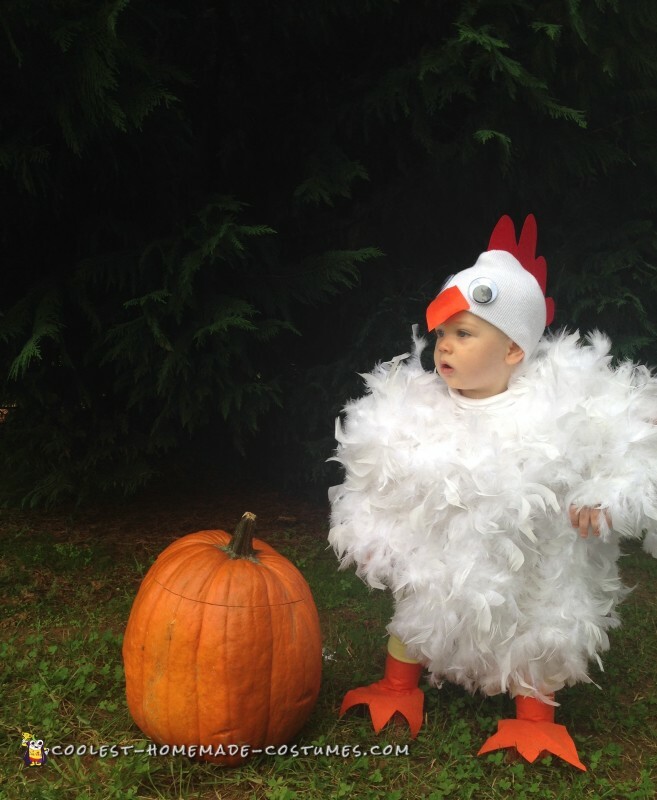 Let’s just say, everywhere we went trick or treating, everyone knew the chicken had been there!